The Mockingbird Foundation is excited to announce "Rutherford", the first in a series of art prints commissioned for our upcoming book The Phish Companion - 3rd Edition. 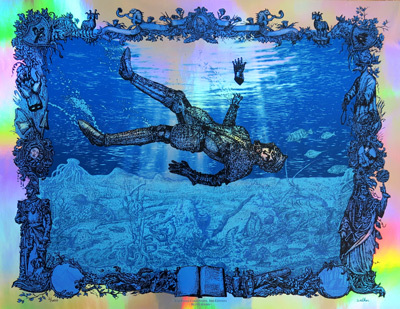 Gloriously executed by the brilliant David Welker, the artist behind Phish's Rift cover art, this print features an armor-suited Rutherford plunging into the depths of a raging river. Framed by rich Gamehendgian imagery, David's stunning interpretation will be reproduced in TPC3 to introduce the first era of Phish. This is the first in a series of eight art prints being created by top artists, each representing a different era of the band's career. Each print will be reproduced in full color in TPC3, and also sold as limited edition prints (both individually, and as a complete set). More details about the print series will be released in the coming weeks. The mirror foil edition of "Rutherford" will go on sale at 12:00 noon EDT on March 31, 2015, via the Bottleneck Gallery website, for $100. Sales are limited to one per person.